The day of the COP inauguration, a conference about CARBON TRADE took place facilitated by Nicholas Stern. The event had the presence of ministers and other authorities of different countries. Surprisingly the center of the discussion was how to allow developed countries that are not going to be part of the second commitment period of KP to have access to market mechanisms of the same KP that they deny to be applicable to them. Another central issue was how to solve the crisis of the carbon market. Half of the 100 billion dollars to be provided for climate change by 2020 would come from carbon credits, commented Mr. Stern. The collapse of prices in carbon market is a menace to financial provision for climate change, expressed Stern. Carbon markets are not a solution to the climate change crisis… Instead of discussing one of the instruments for supporting mitigation actions, which is carbon markets. ; I repeat: ONE of the instruments which effectiveness is still pending of analysis, but from our view is a complete mistake, instead of that, we should discuss the structural elements of a comprehensive response to Climate Change Crisis. It seems that developed countries are more interested in the carbon markets business that in the ultimate goal of this conference which is the structural solutions for this planet and future generations. Carbon markets are just business for some but a bad solution for Mother Earth, facilitating developed countries not to make real domestic reductions. 1. Double counting implying an additional 1,6 Gigatones (GT) to the atmosphere. 4. The opening of opportunities for creating bilateral trading carbon agreements without accounting rules, monitoring and regulation. En asuntos ambientales, Bolivia es el líder mundial. 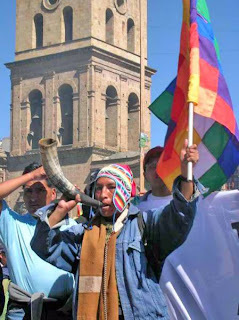 Bolivia is at the vanguard of world environmentalism. ¡Fuerza Bolivia!